The Arri Alexa Plus film camera adds integrated wireless remote control, the ARRI Lens Data System (LDS), additional outputs, lens synchronization for 3D, and built-in position and motion sensors. It shares ALEXA’s image performance, simplicity of operation, reliability in extreme environments and versatility of workflow, and is available either as part of a complete camera package or as an upgrade for the original ALEXA. An advanced electronics side cover permits real-time wired or wireless remote control of camera REC/STOP and lens functions like focus and aperture, using either ARRI hand controllers such as the Wireless Compact Unit (WCU-3) or cmotion’s modular cvolution system.The lens mount of the Arri Alexa Plus model incorporates LDS contacts, allowing lens data and depth of field to be displayed in the viewfinder or on monitors, and making speed/iris ramps easier. Lens metadata can be recorded using ProRes, HD-SDI or ARRIRAW. Arri Alexa Plus is a compact, lightweight and affordable digital camera that will redefine the limits of motion picture capture with ultra-fast workflows and image quality akin to 35mm film. From major motion pictures and high end dramas to commercials, music videos and mainstream TV, ALEXA suits a wide variety of applications and budgets. More than just a camera, Arri Alexa Plus represents an entire image pipeline. By combining proprietary ARRI technology with ubiquitous tools from industry-leading partners, Arri Alexa Plus stands alone as the most complete and powerful digital production system ever built. The Arri Alexa Plus is based on the ARRI designed, fully encapsulated CMOS sensor, which offers a base sensitivity equivalent to 800 ASA, low noise and unsurpassed latitude that exceeds 13 stops. Nevertheless the main advantage of ALEXA will be an easy workflow. Arri Alexa Plus can internally record to Sony SxS-Pro cards. The card slots are located on the camera’s left side. You can choose from the full range of Apple ProRes TM codecs. Arri Alexa Plus is unique in that it can simultaneously record Apple QuickTime/ProRes files, output uncompressed HD video or uncompressed ARRIRAW data. This output versatility makes it ideal for a myriad of productions and workflows from telenovellas to feature films. Arri Alexa Plus has been designed from the very beginning to be more than just another digital camera; it is a platform – a camera system that will accommodate a wide range of upgrades, extensions and accessories, now and into the future. All of the new products shown on these pages are based on this thoroughly modular and future-proof architecture. While the new Arri Alexa Plus model has an advanced electronics side cover for integrated remote control, the RCU-4 and WNA-1 extend the remote control options of both models by making the most of ALEXA’s carefully crafted network capabilities. A set of cables for 3D sync and a low mode set further expand ALEXA’s applications, unlocking some of the tremendous potential of the ALEXA system. It is the camera’s expansive design that makes this possible, and that promises many more exciting advances in the future. The Arri Alexa Plus is an upgrade to the ALEXA camera, adding built-in wireless remote control, the ARRI Lens Data System (LDS), an additional MON OUT video output, an additional RS power output and built-in position and motion sensors. Both ALEXA and ALEXA Plus share the same exceptional image performance, are simple to operate, reliable in even the most extreme environments and versatile enough to cover a diverse range of workflow and budget requirements. 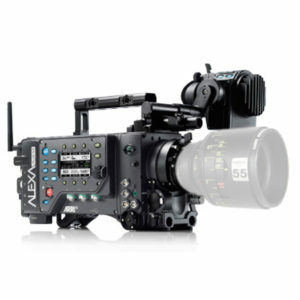 The Arri Alexa Plus will be available in January 2011 as a stand-alone product or as an upgrade to existing ALEXA cameras. Upgrades will be performed at ARRI service centers. Camera Type 35 format film-style digital camera with electronic viewfinder, integrated shoulder arch, built-in support for the ARRI Wireless Remote System (WRS), cmotion cvolution lens control system and ARRI Lens Data System (LDS). Sensor 35 format ALEV III CMOS with Dual Gain Architecture (DGA) and Bayer pattern color filter array. Operating Modes Regular or High Speed mode. High Speed mode requires license purchase. Switching takes approximately 40 seconds. Shutter Electronic rolling shutter, 0.75 – 60 fps: 5.0º – 358.0º, 60 – 120 fps: 356º. Shutter angle setting precision: 1/10 degree. Values behind the exposure index are the number of stops above and below 18% grey. These values are for Log C. Rec 709 and DCI P3 are the same except for 0.5 stops fewer in the low end at EI 160, 0.4 stops fewer in the low end at EI 200 and 0.2 stops fewer in the low end at EI 400. White Balance Separate white balance (red/blue) and color correction (green/magenta) adjustment through Auto or manual setting. Red/blue: 2000 to 11000 Kelvin, adjustable in 100 K steps, with presets of 3200 (tungsten), 4300 (fluorescent), 5600 (daylight) and 7000 (daylight cool). Green/magenta: -8 to +8 color correction (CC), 1 CC = 035 Kodak CC values or 1/8 Rosco values. Sound Level Under 20 db(A) @ 24 fps and ≤ +30° Celsius (≤ +86° Fahrenheit) with lens attached and fan mode set to ‘Regular’, measured 1 m/3 feet in front of the lens. Silent operation at higher temperatures possible with fan mode set to ‘Rec low’. Power In Three inputs: BAT connector, battery adapter back and battery adapter top. All accept 10.5 to 34 V DC. 85 W power draw for camera and EVF-1 in typical use recording 24 fps to SxS PRO cards, without accessories. Power Out 12V connector: limited to 12 V, up to 2.2A. RS, EXT and ETHERNET: input below 24V is regulated up to 24V, above 24V: input = output voltage. Both RS and EXT connectors combined: up to 2.2A. ETHERNET: up to 1.2A. Maximum power draw is also limited by the power source. Environmental -20° C to +45° C (-4° F to +113° F) @ 95% humidity max, non condensing. Splash and dust proof through sealed electronics. System cooling through radiator/single fan. Viewfinder Low latency (≤1 frame delay) electronic color viewfinder ARRI EVF-1 with 1280 x 784 F-LCOS micro display (image: 1280 x 720, status bars: 1280 x 32 above and 1280 x 32 below image) and ARRI LED illumination, both temperature controlled. Image can be flipped for use of viewfinder on camera left or right. Viewfinder Mounting Bracket allows movement of viewfinder forward/backwards, left/right, up/down, 360 degree rotation and placement on camera left or right. EVF-1 controls: viewfinder and basic camera settings, ZOOM button (2.25x pixel to pixel magnification), EXP button (false color exposure check) and jog wheel. Assistive Displays For EVF-1 and MON OUT: frame lines, surround view, camera status, false color exposure check, peaking focus check, electronic level, compare stored image with live image, RETURN IN video and anamorphic de-squeeze. Anamorphic de-squeeze requires license purchase. MON OUT only: Reel & clip number. Control Camera right: main user interface with 3 transflective 400 x 240 pixel LCD color screen, illuminated buttons, button lock and jog wheel. Camera left: operator interface with illuminated buttons, button lock and card swap button. In-camera Recording Records Apple QuickTime/ProRes files or MXF/DNxHD files onto one or two (Dual Recording) SxS PRO cards. All codecs record legal range video with embedded audio, timecode and metadata. Recording Outputs 2x 1.5G or 3G REC OUT BNC connectors for ARRIRAW or HD-SDI video. Both with embedded audio, timecode, metadata and optional recording flag. ARRIRAW: 2880 x 1620, uncompressed 12 bit log without white balance or exposure index processing applied. Requires an ARRIRAW T-Link certified recorder. HD-SDI video: uncompressed 1920 x 1080 4:4:4 RGB or 4:2:2 YCbCr; both legal or extended range. Recording frame rates other than HD standard (23.976, 24, 25, 29.97, 30, 50, 59.94, 60 fps) requires a recorder with Variflag support. Monitor Output 1x MON OUT BNC connector for uncompressed 1.5 G HD-SDI video: 1920 x 1080, 4:2:2 YCbCr; legal range. Image Processing 16 bit linear internal image processing. Target color spaces for SxS, REC OUT and MON OUT: Log C (film matrix off), Log C (film matrix on), Rec 709 or DCI P3. For Rec 709 and DCI P3 a customized look can be applied during record and playback with ARRI Look Files. Optional horizontal image mirroring. Synchronization Master/Slave mode for precision sync of settings, sensor, processing, HD-SDI outputs and SxS recording for 3D applications. Playback QuickTime/ProRes and MXF/DNxHD clips can be played back from SxS PRO cards to the EVF-1, MON OUT and REC OUT. Playback audio is available embedded in the MON OUT and REC OUT signals and on the headphones jack. Audio 1x XLR 5 pin AUDIO IN connector for 2 channel, line level balanced audio input, 24 bit/48 kHz A/D conversion, works at 23.976, 24, 25, 29.97 and 30 fps. Uncompressed audio is recorded into the QuickTime/ProRes file or MXF/DNxHD file and embedded in all HD-SDI outputs, including ARRIRAW T-Link. Max of 2.5 dBm output from AUDIO OUT headphones connector. SD Card For importing ARRI Look Files, camera set up files, frame line files, feature license keys and custom lens tables for the Lens Data Archive (LDA). Stores captured stills from the REC OUT image path in ARRIRAW (.ari, 12 bit), TIFF (.tif, 16 bit), DPX (.dpx, 10 bit) and JPEG (.jpg, 8 bit) format as well as logging files. Also used for software updates.